Alyson Phillips BCA director presenting a cheque to John Boardman towards the irrigation system at the Serpentine Community Farm. 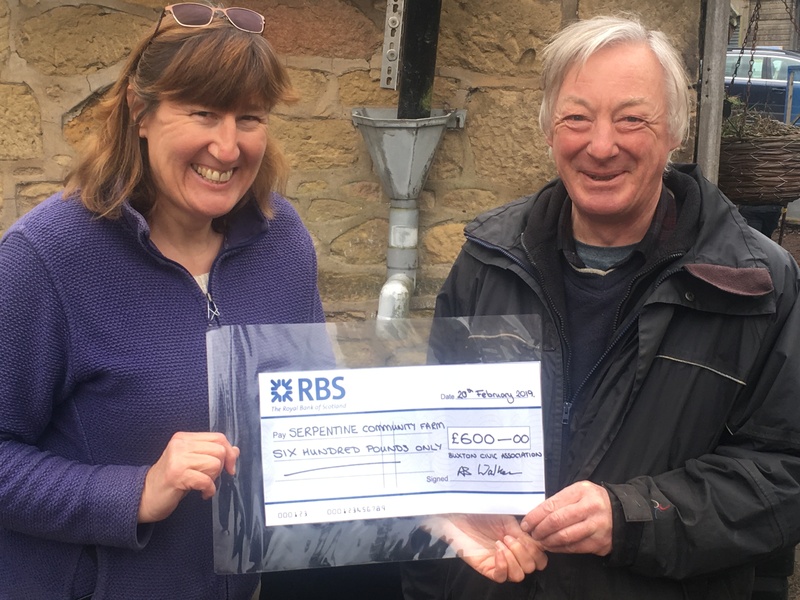 Buxton Civic Association Director Alyson Phillips presented a cheque for £600 to John Boardman, Grower at the Serpentine Community Farm, to fund the cost of the components for an automatic watering system for the greenhouse and polytunnels. The Serpentine Community Farm is off Burlington Road and is open on Wednesday’s and Sunday’s from 11-3 pm. Visitors and Volunteers are welcome. The farm, established in 2014, aims to restore derelict council owned greenhouses that are situated just off Serpentine Lane in Buxton. Volunteers are welcome, and the next volunteer days are Wednesday 22nd February, and the following Sunday, 26th February.